Autonomous vehicle technology or "self-driving car" refer to vehicles that use sensory data of the surrounding environment to navigate without the use of human drivers. The technology is still in development, but is an emerging global market. By 2025, the car market for partially autonomous vehicles is expected to be at 36 billion U.S. dollars while the market for fully autonomous vehicles lags behind at 6 billion U.S. dollars. Waymo, a subsidiary of Google's parent company Alphabet Inc, is one of the biggest investors in autonomous vehicle technology R&D. The company has filed 338 patents for the technology between 2010 and July 2017. Examples of autonomous vehicle technology components include driver assistance systems, automotive radars, ADAS ultrasonic wave components, LiDAR system sensors, among many others. The global market for automotive radars stood at 1.2 billion U.S. dollars in 2015 and is projected to grow significantly by 2021. Moreover, consumer interest for autonomous vehicles is growing around the globe. In 2016, a poll by the MIT in the U.S. found that 19 percent of respondents aged between 35 and 44 were willing to use partially autonomous vehicles, while 15.4 percent of respondents aged 75 or older said the same. 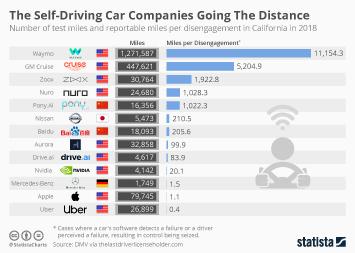 Despite potential advantages, customer concerns still loom over the technology as users are unsure if they are ready to share the road with these driverless vehicles. Topic: Vehicles in use in the U.S.